Yup, we’ve all heard it. “Just ignore your dog’s barking/jumping/biting and they will stop.” As Dr. Phil so elegantly puts it: How’s that working for you? Well, I don’t know about you, but it never came close to working for me. Ignoring bad behavior is not just bad advice, it’s dangerous advice. I would never tell my 5-year-old nephew (or 90-year-old grandma) to ignore a jumping dog. I want the people in my home to be safe and secure, and a jumping dog could create injuries. Stopping a bad behavior requires one simple step. You need to correct your dog. What does that mean? I will explain. Correcting a dog means that whatever behavior you want to stop needs to be uncomfortable for the dog. I don’t care what you tool you use (or don’t use) to stop this behavior. You can pop the leash, use a remote collar, shake a can of pennies, or use a squirt gun…as long as the behavior stops. If you squirt your dog with water and they continue jumping/barking…that method obviously doesn’t work. Try something else. One method of correction might work for jumping, but you might need another for barking or nipping. Please do not just ignore bad behavior. Not saying no is always saying yes. If you have any questions or need any tips please feel free to contact us here. Thank you for reading! Does this sound familiar? I hear this all the time from my clients. It seems logical that if we “tire” out our dogs then they will be calm inside the home. That they won’t chew on things and act crazy in the home and jump on people. Right? I have a relative who consistently tries to quit smoking. Just because he goes to the gym and works out, and then goes home and takes a nap does not mean that he has quit smoking. It just means that he is tired from working out. Stopping a behavior is a mental choice, not just a tired body. Exercising a dog to tire them out will just create a stronger, faster dog that can do the unwanted behavior longer than before. To teach a dog how to be calm around exciting environments and people you will need to correct unwanted behavior, and then reward behavior that you DO want. If your dog barks at people that come into your home you can correct the barking, and then when the dog is calm and quiet you can reward them. Stop exercising your dog to try and get good behavior. You will just find yourself frustrated and exhausted, and your dog will be up from their nap soon and ready to go again! For some tips and advice on how to create a calm dog you can check out my DIY Dog Training videos, or you can contact me here. Okay, okay. This title might be “click bait”. But hear me out. Killing your dog with affection sounds extreme, but it’s really not. I saw it happen all the time with my foster dogs. These dogs would come to me with no chances left. They had bite records and massive anxiety….all because of too much affection. Giving affection to a dog is like feeding your kid on a diet of candy. It causes health issues, attention deficit issues, and major behavioral issues. You get dogs that don’t listen, jump, bark and yes, even bite. And by giving unearned affection you are ENCOURAGING these behaviors. You are telling them whatever they decide to do is okay with you. And here’s where it gets dangerous. You know how your dog barks and lunges at strangers? When you bend down (or pick them up) and talk soothingly to get them to stop…you are training your dog to be aggressive. With petting and soft soothing tones you are telling your dog it is a GOOD thing for them to be scared and to bark and lunge. Absolutely! But hey…how about they EARN it first? How about you treat your dog, and hear me out here…like a dog? You need to love your dog how THEY need to be loved. And dogs need to be loved by providing them with rules, with boundaries, and correcting them when they do stupid and harmful behaviors. I am a dog trainer and I give my dogs all the love in the world. They get lots of squeezable hugs, and soft baby voices, and kisses. But guess what? They also get lots of crate time, lots of structured walks, and yes…even corrections for behaviors I don’t want. Stop giving your dogs too much affection. Love your dog so they can be mentally healthy and happy, and not the way that only makes YOU feel good. Thanks for reading! If you would like advice on how to interact with your dog you can email me here. Listen up, people. Stop putting your dogs and puppies in the backyard unattended. Does this sound a little harsh? Maybe. But a vet bill for $1000+ when your pup ingests a pillow from the outside lawn furniture sure feels a lot harsher. Puppies and dogs have the mental capacity of a 2-4 year old. I have never met one responsible parent who left their toddler unattended in the backyard for hours at a time. Our dogs are no different. I understand that you want the dog to get some fresh air and exercise when you don’t have time for a walk. I do too! But backyards make poor babysitters and GREAT demolition derby zones. It is the perfect environment for dogs to practice bad behavior to their loyal canine heart’s content. A dog needs structured exercise and designated playtimes. Stop using big words, Bethany, what does that even mean? This means go for a walk with your dog. Put a leash on your dog, teach them how to heel…then go for a walk around the neighborhood. Get out and smell the roses. Give your dog a chance to do what they do best…walk and sniff. Then come home and teach them tricks or play fetch. You made the choice to bring a pup into your life, give them some attention and more importantly keep them safe! Thanks for reading! For tips about healthy dog activities and how to help your dog heel please contact me here. Feeling Like Your Voice Doesn't Matter? I don't know about you guys, but it seems more and more the voice of the "little guy" matters less and less. From cell phone carriers throwing extra fees onto your bill, to restaurants not caring enough to get your order right...you feel lost and overwhelmed. While big change takes time and comes slowly (if at all), there is one area of your life where change can happen quickly. That area consists of four feet and a waggly tail. Does your voice matter with your dog? Answer honestly, guys. THINK...don't just give me the generic answer that your dog is a good dog. I'm not talking about in your home when you have a treat in your hand. I'm talking about when you are outside, or in public, and your dog barks. How about when they jump? How many times are you saying "no" before your dog stops their behavior. And an even better question...you have already said "no" thousands of times. Why are you still getting this behavior? If this is happening in your life...then obviously your voice is not being heard. Imagine if you had to repeat EVERYTHING you say to family three times. Oh my gosh...how annoying and frustrating would that be? And yet...we do it with our dogs all the time. WHY? Why are you letting your dog continue behaviors you don't want, and allow them the leisure of waiting until they feel like obeying to finally obey? I wish I had that leisure. I wish I had the leisure of paying my rent until I felt like it. Or the leisure of taking whatever I wanted in the grocery store and paying for it when I felt like it. We have rules in society for a REASON. It makes living with other people enjoyable and fun. Our dogs are not buttercups or fragile flowers...correct them when they break a rule. They deserve the same courtesy that we give humans. We spell out rules clearly and hold them accountable so life can be enjoyable. Your voice may not be heard in the big outside world...but it DEFINITELY should be heard in your living room with your dog. Thanks for reading! If you have any questions feel free to contact us here. Does your dog bark at strangers in the house? How about when you are outside and someone approaches? Does your dog run up and bark at them? Don't be fooled. Your dog is not "protecting" you. I encounter this a lot with potential clients. After all, the behavior certainly looks like they are protecting you. But I promise, they are not. There are a variety of factors for why your dog may be displaying this behavior. I am going to talk about 2 of them. Your dog does not have a leader in the home. Therefore, your dog does not believe that anyone in the home will protect them. This results in an insecure and anxious dog when exposed to new people and situations. An insecure dog will bark (and sometimes bite) the perceived threat. This makes the threat go away so they can feel comfortable again. Your dog feels they own you. After all, why wouldn't you want to guard something that gives you wonderful food, soft beds, great toys, and all the love and attention in the world? You are their goose that lays golden eggs! Much like a dog will growl or bite when you try and take a bone away...you are the bone. Anyone coming up to greet you is trespassing on their property. Your dog will bark, growl, or bite when they are faced with the prospect of losing their prized possession. So next time your dog barks at someone coming near you, just remember that your dog is not protecting you. Your dog is missing a leader in their life. Be that leader for them..they deserve it. For free advice on how to stop barking please contact me here. I give this tip away for free when I talk to a potential client. I give this tip away for free when I meet people for evaluations. And I give this tip away for free in blog articles like this one. Are you listening? I GUARANTEE this will change your whole world with your dog. CRATE YOUR DOG. Wait...what? That sounds too simple. How will crating my dog make me not need a dog trainer? By not letting your dog roam throughout the house they learn boundaries and are kept safe. A calm dog does not bark, bite, jump and cause you stress by being a nuisance. A contained dog is a safe dog. They do not chew up socks, furniture, or poop and pee in the house. Did you know that barking, biting, potty training and calming hyper dogs IS MY WHOLE BUSINESS? If people crated their dogs more, I wouldn't be needed...well, mostly needed. Ha ha. Try it in faith and see what happens. You will join the rest of my clients in wondering in amazement why they did not try this before. You will be amazed and astounded at what other nonsense behaviors will disappear as well. It is the best magic trick in the books! You got this. You are an amazing dog owner and you want what is best for you pup. Love your dog even more by crating them. If you need any crate training tips for a rambunctious dog please contact me here. Believe it or not, I run across potential clients that I can not help. Their dogs are barking, pulling on the leash, jumping, biting and holding the humans hostage in their own home. And I have to walk away. Because I can't help those that don't want to be helped. Sometimes I have clients who ask me to help their dogs stop lunging on the leash, barking at other dogs and people, stop stealing food right out of guest's hands, and multiple other bad behaviors. And yet when I show them how to stop the bad behavior in a matter of seconds they refuse to implement the training I showed them. They refuse to stop a life-threatening behavior because they don't want to correct their dog. Not stopping your dog's bad behavior because you "love" them is the equivalent of getting rid of all traffic lights to try and make driving easier. What about all the traffic accidents and killed pedestrians because there are no rules on the road? What about the collateral damage to your car, and maybe even physical therapy for years? Getting rid of all traffic lights SOUNDS nice and fluffy... But when you actually take a look at the reality?...there's nothing but chaos, damage and pain. Getting rid of rules for your dog SOUNDS nice and fluffy... But when you actually take a look at the reality?... You are risking your dog getting mowed down by a car because they ran away, or getting cut open by a vet to remove something they should not have eaten. Teach your dog not to grab stuff out of the trash, run away, and jump on people. If you care...you will have rules. Do you have to leave your dog home alone during the day? Are you worried that they might get into something or hurt themselves? With all the new technology that we have these days there are LOTS of options to choose from to keep your pet safe. And here's the BEST one. These new-fangled inventions of the Furbo dog camera, or a Whistle GPS tracker (which means you have LOST your dog in the first place) can run you into the hundreds of dollars. And from what I've seen with my friends...they don't stand up to dog teeth very well. Buy a crate. It'll cost you $20-$60 on Chewy.com. Stop throwing your hard-earned money on items that will just show you the damage your dog is causing to your home in real-time. When I get in the car I put my seatbelt on. When I leave the house I lock the door. When I can't supervise my dog I put them in their crate. WHY? Because humans are precious, my house is valuable, and my dog needs to stay SAFE. Most of the time technology trumps what came in the past. Crate your dog. Only YOU can prevent house damage. Thanks for reading! If you need any tips on crate manners please feel free to email me here. EVERYONE has one, or has a friend with one. A dog that barks. Whether it's a person walking by the window, a car door shutting, or child laughing, SOMETHING triggers your dog and they run to the window and bark like there's no tomorrow. I'm here to tell you 2 ways to stop your dog from barking at the window. This is the simplest method and also the one I recommend to people who leave their home while the dog is unattended. If the dog is not AT the window, then the dog can't see what's going on outside and generally does not bark. Not only does this help with uncontrolled barking, this also keeps the dog safe from wandering the home and getting into the trash and chewing up socks and furniture. Not only will this help your dog stop barking at the window, it helps stop barking even when you're home and the dog goes outside and likes to bark at anything that moves. The bark collar should deliver a correction that's FAIR to the dog. So please do not buy a cheap one that may hurt your dog. I'm a fan of the Garmin Bark Limiter Deluxe (click here for link). This collar can be set to give a warning first, and then starts at a low level and increases the level if the dog continues to bark. Please DO NOT get a citronella bark collar as this punishment is cruel and unfair to the dog. If the dog barks it is sprayed in the nose with a citronella scent. Their little noses are thousands of times more sensitive than ours, and the smell LINGERS for hours. A fair and correct punishment should last 1 to 2 seconds and be delivered in a timely manner. All dogs bark, that's what they do. In order to live in a civilized society we need to teach our dogs when it is appropriate to bark, and when it is not. I hope this article has helped you. Please feel free to email me here for advice. There's a leash law in almost every city in America. The point of a leash law? So you can keep control of your dog. Right now, the leash law in America has turned into "make sure you can drag your dog away from another dog" law. Whenever my dogs are off-leash and minding their own business, sometimes I see people with panic in their eyes. Are your dogs going to come over and eat my little dog? Or jump on me? Or harass me? No. They are not. They are 50 feet away sniffing the bushes and fetching their ball. My dogs don't care about you. No offense, but you're just not that interesting to them. The dog I AM afraid of? The one on the leash. The one that is yapping at my heels and pulling so hard that the owner is struggling. People should be afraid of THAT dog. If the owner ever dropped the leash, or the retractable leash extended to where the dogs could reach me...I would be in danger of being hurt. Leashes are a communication tool. You can use a leash to tell a dog to knock off their bad behavior. Or to give them praise when they do something right. Or just to convey calm, positive energy to your dog to help them calm down. Don't get me wrong. I'm GLAD your dog is on a leash. And I'm sure the local cats are glad, too. Thank you for obeying the law. But there is another way of using the leash. COMMUNICATE with your dog. Don't just man handle them until the other dog/cat/person has gone beyond the realm of their interest. Have a conversation with your dog. Tell them "Hey, you're not allowed to bark at everything and drag me down the sidewalk." If you would like some tips about how to get your on-leash dog under control please contact me here. Have you thought about getting a dog for your family? Is it still just a thought in your mind, or have you discussed it openly? Perhaps you've already made a trip to the shelter but haven't found the dog you're looking for yet. Stop! You've already made your first mistake. So many people have a breed already picked out that they are interested in. These days huskies seem to be super popular, as well as German shepherds. The mistake you are making? You are picking out a breed that you want PROBABLY based on the dog's looks. You see that breed on movies, or your friend might have one, and they just LOOK cool....or cute...or cuddly. Don't deny it. I know what you're thinking...because I used to be in your shoes. Instead of deciding on what kind of dog you want based on their looks...change your perspective. What kind of dog is going to be good for YOUR family? Are you active? Do you travel? Do you work full-time? How much time and energy do you want to dedicate towards training? Who's going to be responsible for the dog?....let me ask that last question again. Who is REALLY going to be responsible for the dog? I run across people owning German Shepherds who live in apartments. Or people who have a husky because they wanted an emotional support dog. Think about what I do for a living. If I'm in your home, it's not because everything is hunky dory. And while there are people who can appropriately take care of German shepherds in apartments...and have huskies for an emotional support animal...they are FEW and far between. The exception more than the rule. So...when you are going to make that big leap and get a dog, remember this. Your dog is going to be a guest in your home for 12 years. What kind of guest do you want? A guest that parties all the time and you have to lay down strict rules and structure in order to exist together? Or a best friend that has your same standards, and loves to do the same things you do? Take a moment...do some research. Decide what's best for your family. Skip the rowdy trouble-making guest...and spend 12 years with your new best friend! If I Ignore My Jumping Dog Will He Stop? Is your puppy or teenage dog jumping on you and your guests? Do your kids get mauled by your dog's excited jumping behavior during playtime? Let me guess. You have tried yelling at your dog to stop the behavior or throwing them in their kennel as "punishment." Has that stopped the jumping? If you read further than this, I'm guessing not. Ignoring your jumping dog WILL NOT MAKE THEM STOP. To teach a dog not to jump the act of jumping must be intolerable. What does intolerable mean? It means unbearable to the dog. Whether that is a squirt of water to the face, shaking a can of pennies, a bonker thrown at the dog, a prong collar correction, or any other method you have found that works for your dog. In order to stop a behavior the behavior must be intolerable. A lot of people would like to teach their dog to sit and get a treat instead of jumping. Great! However, I don't want to DISTRACT my dog from jumping...I need my dog to NOT jump even when I'm not there, or I don't have a treat in my hand. The only way to accomplish this is to put an inhibition in the dog's mind by making the act of jumping intolerable. With my personal boxer mix we tried turning our back to the dog, ignoring the jumping, or trying to get him to sit and give him a treat FIRST. All of that failed. It wasn't until we made jumping intolerable for him that we finally got his attention. Then we were able to go ahead and train him to sit and give him a treat. If you are struggling with a jumping dog I am happy to help. Please feel free to contact me here. Thanks for reading! Being Held Hostage by Your Puppy's Biting? "We love our puppy but it's hard to play with him because he bites so much." "Our puppy is really hurting the kids with his biting, how do we stop it?" "We've been using treats and toys to stop his biting but it's not working, can you help?" If you any of the above questions have crossed your mind, or come out of your mouth, don't worry, you're not alone! When I get calls for puppy training these are almost always top of the list problems that my clients face. Just like you, they have researched online and found differing opinions and advice on how to stop a puppy from biting. If you have researched online and tried different solutions to puppy biting and you found one that works, great! Keep doing it! However, in my line of work, I usually get a call for help because people have tried multiple ways to stop biting and for their particular puppy it is not working. Just like humans, each particular puppy has their own personality and temperament. I've run across puppies where all they needed was a finger snap and a verbal "no" to stop biting. I've also run across puppies where a gentle aversive needed to be put in place. For help TODAY with puppy biting shoot me an email here for help. I'd love to talk to you about your puppy, and find the correct way to communicate for YOUR puppy to help them stop biting. Dog Destroying Your Home While You're Gone? Fix it With This One Step! "Be good while I'm gone" you say, with one last look at your pooch as you close the door. You lock the front door then watch your pup's cute face staring at you from the window as you drive away. How many times has this scene played out in your home? Do you REALLY think it's going to work this time? No, of course not. But I know you HOPE it will. What if I told you I could get your dog to stop destroying your house in 3 seconds? I can. And you can, too. Here's how. "It was the best thing ever!" "I can't believe I haven't done this before!" "The peace of mind was so awesome!" "My house was intact and my dog was so happy when I got home!" I don't expect a four-legged carnivore, that has the mental capacity of a 2-year-old, to make adult decisions with no supervision. And neither should you. If you have a dog that is good in the home with no supervision, that is awesome! If you don't need to crate and you don't want to crate...then don't. But for people who's dogs get into trouble with no supervision...just crate your dog. I understand your desire to give your dog as much freedom as you possible. But if your dog is making bad decisions that can harm its health...then you need to take away that freedom. A warm, safe, sleeping dog in a crate is ALWAYS better than a stressed, sick dog at the vet's office. If your dog needs help staying calm in the crate please don't hesitate to reach out to me for tips and advice. Could My Dog Ever Play Nicely With My Kids? Parent buys a dog for the children. The dog is a little anxious and nervous. Dog struggles to escape or avoid the playful children...one child gets too close and the dog lunges, growls or snaps at the child. Enter cue for dog trainer (me). Is it possible for a dog that is currently displaying nervous/fearful/aggressive behavior around children eventually learn to play with them nicely? Maybe...maybe not. We need to start from the premise that every dog is a UNIQUE being with a UNIQUE personality. Some dogs are super playful, others like to be quiet by themselves. Some dogs like to play fetch, others like to be chased. Some dogs LOVE to swim, others couldn't care less for water. Some dogs like to be petted and cuddled, others are okay by just being in the same room as you. You get the point. As a dog trainer my philosophy is not to change a dog's personality, it is to help that dog become properly socialized around people, other pets, and environments. By this I mean my goal is simply existence. My german shepherd mix used to run towards any dog she'd see and attack it. Didn't matter if it was 5 feet away or 50 feet away. I desperately wanted her to be best friends with every dog she saw, and to run around the park with another dog and be happy. I learned that's not who she is. Not wanting to force her to be something she's not...I opted for existence. Now, she no longer runs towards other dogs to attack them. She looks at them, acknowledges that they exist...maybe even sniffs their bum...and then moves on. She doesn't need to be best friends with every dog she sees. She doesn't have that personality. But she certainly needs to learn to exist CALMLY around them. So...will your dog be able to play nicely with your children? Quite possibly. It all depends on their personality. However, at the BARE MINIMUM dogs should be polite and calm around the family. People are not being told the truth about crates...and it's time for me to speak up. Crates limit your dog's freedom. They limit the choices your dog can make. They are not free to go outside anytime they want. They are not free to wander the house and stretch their legs. This is true. Crates limit your dog's freedom and the choices they make. Um...isn't that a GOOD thing? If I have a living being, of another species, who has the intellectual fortitude of a 2 year old child I ABSOLUTELY want to limit their freedom and choices they can make. The nature of a dog is that if something smells good...they will eat it. If it moves...they chase it. If it's cold out and they don't want to go outside...they'll pee and poo inside. If they want to do something that makes them feel good (like ripping the stuffing out of pillows)...they will do it! I would not let my toddler run around all day unattended, and I CERTAINLY won't let my dogs run around my home unattended. Especially if they are KNOWN trouble makers. If I can't have my eyes on my dog when they are free, then they will be placed in their crate. For their safety, and for the safety of my house. I run across this statement all the time "When I put my dog in the crate they don't like it. They whine, bark and howl. I don't want him to do something he doesn't want to do." I feel your pain. I really do. My dog used to chew holes through his crates, and bend the metal door enough that he could escape. BOTH of my dogs escaped their crates and wouldn't stay put in them...especially when I was gone. They would whine and try and push the door open. But guess what? I'm smarter than my dog. JUST like I'm smarter than my 3 year old nephew. I don't care if he doesn't like to get in his car seat, he needs to do it for his safety. I don't care if my dogs don't like their crate...they need to do it for THEIR safety, too. When I leave the house I need to know my dogs are curled up in a ball, fast asleep, warm and calm in their crate. It's not cruel...dogs are den animals. Meaning, their natural instinct is to curl up in a small ball in a relatively small area when they sleep. I don't need multiple apps on my phone to check in on them during work, or rush family visits because I need to get home and make sure the dog is okay. I KNOW the dog is okay...because he's safe in his crate. I don't have to re-buy all my children's toys because they were chewed up while I was away...because the dog is safe in his crate. I don't need to spend $1200+ on a surgery because my dog ingested something he shouldn't have...because he's safe in a crate. So the REAL truth about crates? They keep your dog safe and they give you peace of mind. So...quoting ALL of my clients AND myself: "I love the crate! Why didn't we do this before!?" If you need tips or advice on teaching your dog how to be calm in the crate please feel free to email me at: bethebossdogtraining@gmail.com. It's Christmas morning, and little tykes with rosy cheeks and fluffy heads scamper down the hallway. Before you can catch them, it's a snowstorm of wrapping paper as they tear into their presents. But wait...there's ONE more box. What could it be? Piercing screams of delight fill the room as a soft, downy head peeks over the edge of the box. Big or small, spotted or patchy...a puppy is pulled from the box and squashed in hugs by toddler arms. "Thank you, Mommy!" they cry, as all other presents are forgotten in lieu of this newborn canine. Hearts are happy, and laughter is abundant as the rest of the day is spent oohing and aahing over this new life form. A name is picked...a collar is bestowed on the furry neck, and your family has officially grown by one member. Life is perfect. The first couple months with the puppy are wonderful days. Potty training is sometimes frustrating, but he catches on quickly and soon enough accidents are a thing of the past. Your pup learns to explore, and is the cutest thing EVER as he races around in the snow and plays with the kids in the house. But about 4 months in, you notice something strange taking place. Your puppy has developed behavior that you don't want in your home. Maybe it's nipping the kids, chewing the furniture or jumping on guests. "Oh well," you think "he's young enough that I can just take away what he has...he'll eventually grow out of it." And you move on. 7 months in, and things are not going so smoothly. His unwanted behavior is now what you call unwanted habits. He's big enough that when he gets your socks you can't easily chase him down to get them back. Your new $1500 couch you bought for Christmas? Well...you're never going to get any resale value now with all those teeth marks. That crate you didn't want to use to take away your puppy's freedom?....now it's a migraine yielding contraption from the howls of your pup when you HAVE to use it. And what happened to the kids playing outside and taking him for walks? When did THAT stop? Did it stop because he pulls so hard on the leash that your 4-year-old got a bloody nose from being pulled over? Or did the walks stop because YOU were the only one walking him, but now life is too busy to handle that responsibility? Then comes the day when your Christmas puppy growls and nips someone, or lunges and barks at your neighbor, or bites the mailman. You apologize to the mailman, and feel frustrated at your not-so-new pup. Into the crate he goes as punishment. As the weeks go by, you realize your pup (now dog) is spending most of his time in the crate because his behavior is so out of control. You feel guilt and frustration that you want to help fix your dog, but there's no time for him now. No one really pays him any attention anymore. What a sad, depressing story. Why would someone even blog about this!? But wait! There's a solution! And a REALLY easy one, too! TRAIN your Christmas puppy! Enroll them in a puppy program at your local pet store. Find a balanced personal trainer for some one-on-one lessons. Search YouTube and train your puppy yourself. And seek professional help when you run into a problem you don't have the knowledge to solve yet. Would it shock you to know that I fall into the group of people that got a Christmas puppy...and didn't train him? And that I did it TWICE? That I've experienced ALL of the above problems (and more) and my story actually turned out happily ever after? Click here to read my inspiring story. You love your pup and your pup loves you. It's the BEST thing in the world to see your whole family thrive as they all participate in training. It's exciting and rewarding to watch your pup learn and grow. Experience the joy of being able to take your pup with you on vacations, camping trips, and family gatherings. Have the joy of off-leash walks (where appropriate) with the confidence that your dog will come when called. My favorite thing to do with our obedient dogs? Take them with us everywhere we go, especially if the stores we shop at are pet-friendly. Your Christmas puppies don't HAVE to become Christmas problems. They can be a gift that keeps giving joy for many, many years. Did you know that I see small dogs engaging in more life-threatening behavior than big dogs? Most people protect their small dogs. They protect them from illnesses, getting cold or getting hit by a car. But did you know you need to protect your small dog from him/herself? Let me explain. I have a german shepherd. She used to attack any dog that came close to her, or that she interacted with. We found a great trainer, and now she can play and interact with other calm dogs. This has made our lives better, and made the dogs in our neighborhood safer as well. However, on our daily walks throughout the week we always run across different small dogs. Some of them run away from their owners and run directly up to my german shepherd. Most of the time, the frazzled owner is right behind their dog frantically calling them to come back with little success. Now...I'm never worried about my dogs. They are both around 50-60 lbs. The risk to their life is pretty minimal. If the small dog is truly aggressive they may get bitten, but it's never a life and death situation. The story for the small dog is different. I've heard a handful of owners yell to me..."Don't worry! My dog is friendly!" And that's great, I'm glad your dog is friendly. But guess what? Did you know that my german shepherd may NOT be friendly? Thank GOODNESS she's trained, and the likelihood of your dog getting bit is pretty small. But what if your dog ran up to another big dog that is NOT friendly and NOT trained? (Which happens A LOT by the way. It's probably the norm). The bigger dog doesn't care if your dog is friendly. It doesn't care that your small dog is named Fluffy or Spot and is all bark and no bite. The big dog WILL bite your small dog. And due to the size difference, guess who gets the short end of the stick? At best?...massive injury. At worst?...probably death. Keeping a small dog safe from illness, cold and being hit by a car are very responsible things to do. But what about keeping the small dog safe from him/herself? Training your dog is loving your dog. After all, for a small dog it could be a matter of life and death. Has your dog ever been assaulted by another dog? How about a BIG dog? One that was coming right for you? Here's my story...and why I am grateful for the ecollar. My dogs and I were assaulted by an off-leash German Shepherd last Monday. The off-leash dog was young, aggressive, and the owner was nowhere to be found. My dogs were leashed, obedient, and had an experienced handler. I knew the second this shepherd zeroed in on us there was going to be trouble. He made a beeline right for us. There was no time to turn around, cross the street, or yell for help (preferably from the owner...which was nowhere to be found). I stamped my foot...yelled NO as loud as I could. Dog kept coming. I grabbed my Pet Convincer (which sprays air in the dog's face and makes a scary sound) and sprayed it directly in the dog's face. Dog didn't even care. By this time it was every dog owner's worst nightmare. An aggressive dog right in your space. Leashes were getting tangled and I was afraid I might break a finger so I purposely dropped them. Having your dog leashed when they are getting attacked exacerbates the fight. If my dogs are being attacked I want them to be able to defend themselves. Within a second there was a full blown dog fight between my German shepherd and the off-leash shepherd. Knowing better than to get in the middle of a dog fight I grabbed the remote for my dog's electronic collar and pushed the button. She immediately left the fight and ran back to me. The off-leash shepherd...seeing that my boot was swiftly coming his direction...decided to call it a day, and ran back the way he had come. Of course, my foster dog who LOVES to herd and chase anything that moves...took off after the fleeing desperado. A single tap on his Ecollar brought him back to my side. I am extremely grateful that I had Ecollars on my dogs. Without them I would not have been able to de-escalate the dog fight so quickly (or safely), or call my foster dog back to me. 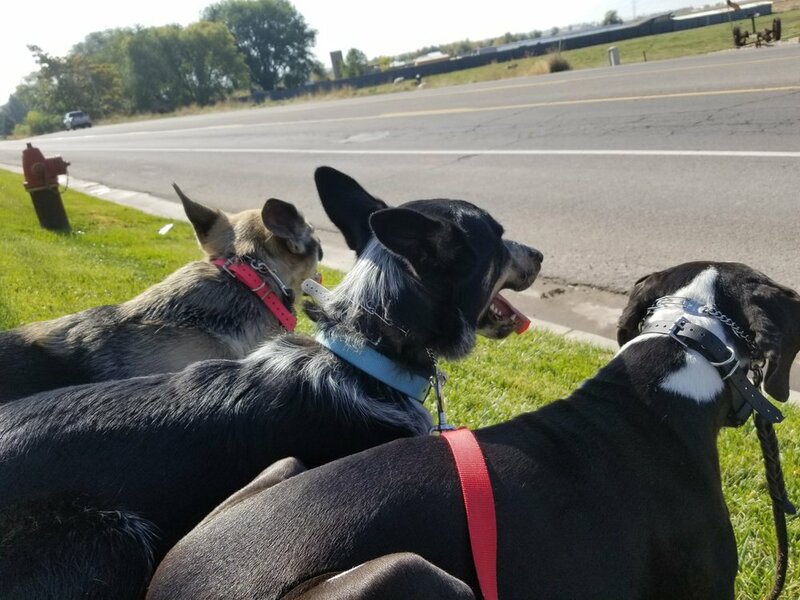 With the busy road we were on there was a high chance that one...or all...of the dogs would have been hit by a car if I wasn't able to gain control of the situation quickly. This isn't the first time their Ecollars have kept them safe, just the most recent.